This is not the clichéd title of a wedding invitation but the narration of events that led to a wedding. For, Sandesh is a Pambada, a caste of Dalits who are considered untouchables, except when they get possessed by spirits – sorry not those of the volatile kind but the local ones known as Bhoothas – for which a ritual called Bhootha Kola is performed. It is the members of this caste who dress themselves as Bhoothas and perform the associated rituals! The moment the costume is removed they become untouchables. Deepti belongs to a caste called as Kottaris and is studying for her masters in commerce while working at a mall. We have performed many intercaste, interreligious marriages but the maximum opposition has been when one of the couple is a Dalit. As to be expected, Deepti’s family was very much opposed this match and three days ago she fled home and started staying as a paying guest. Today it was a tearful shivering young woman who had come to meet me, worried about her fate and that of her beloved. This was because her family had arranged a match for her from her own caste, a young man who was a relative of the head of a most feared moral police of the Hindutwa right wing! She was scared that his goons were searching for her. In fact, all the documents needed for her marriage were kept at the place where she used to work, and she was scared by her former colleagues who told her that a close watch was being kept on her locker by the minions of this man. She had come to us for help along with a middle-aged lady whom we assumed was her relative- but it was not! She was Sandesh’s mother who had come with her out of love for her to-be daughter-in-law. By that time a number of progressive organisations had been intimated and also some very progressive minded journalists. While we tried to get her documents from the place where she used to work, some goons from there tried to follow her and then it was a ride straight to the office of the Commissioner of Police, Sri Seemanth Singh who had instructed his office to give all help for the couple. By the time we reached the office, ony Deepti’s brothers were there and they informed the police that they had absolutely no objection to her marrying any one of her choice. So, in the evening one progressive-minded priest, Jayaram Bhat, performed their marriage in the presence of journalists and progressive minded organisations like DYFI, Samudaya, AIDWA, Insurance employees union and the Dakshina Kannada Rationalist Association! For the last named, though religious marriages are not their cup of tea, under some circumstances, particularly when registration has to be done immediately, this sort of ritual becomes necessary. In a state like Karnataka where self respect marriages are not recognised as common law marriages for registration purposes, some sort of a formal drama becomes necessary for registration purposes. We are very happy that Sri Jayaram Bhat has been co-operating with us for the past two decades whenever the need arises. You guys are doing a great service to these young folks in love! We should all take a feather from your caps and apply it to our lives. Follow up- Today 24th December Deepti and Sandesh went to the Sub registrar’s of Mangalore city to get their marriage registered. The people there objected to my seal of name and address and also to that the one of the witnesses was a Roman Catholic or rather had such a name! They called me asking for a solution. I told them to inform the registrars’ office staff to put their objections in writing and reject the application on those grounds. I also told the couple that if they don’t do it I am going to come there to speak to them. The job was done in 2 minutes! Reason- read at the sub registrars office on this site! It is a relief that there are progressive moderates like Mr. Bhat, though as you say, it will be best if the need for their intervention is outgrown outright. Have there been formal attempts, legislative or civil-society-led, to universalize the recognition of ‘Self Respect Marriages’ throughout India? Great work. This young family will be very grateful for your courage and help 🙂 But I wish this stone-age social mindset of people changes quickly. Couples like these need not just the ability to get married, but also social acceptance and support, especially from their friends and relatives. What an absolutely horrifying experience for a young woman. I cannot imagine the sort of mental torture she would have had to go through. It is really very heartening to note that there is such a multitude of organizations and progressive people willing to extend moral and material support to young people who get caught in the mires of the caste system and the assortment of other discriminatory systems which continue to exist in Indian society today. The couple certainly looks amazing together and that hint of a smile on Deepti’s face is enough to give this barmy old codger all the Christmas cheer he needs. 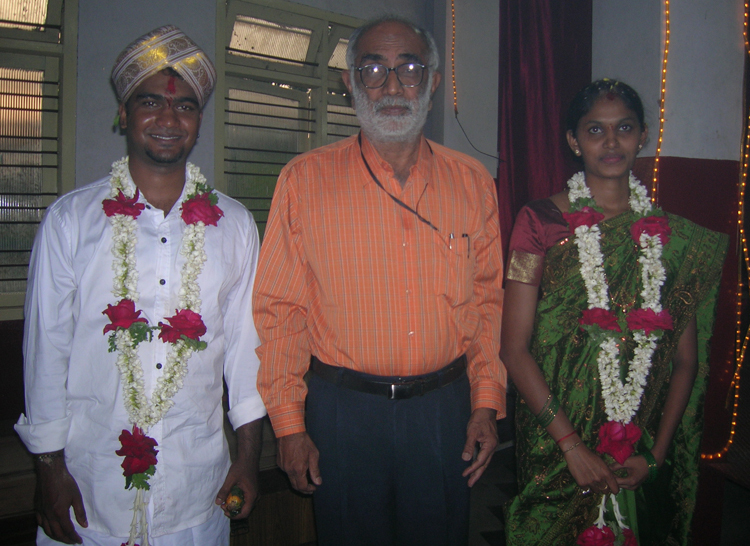 May they have a happy married life and may their (and Narendra Nayak’s) tribe increase. Afraid to take your caste share of land FC(5-15%), BC(50%), SC/ST/Minorities(35-45%) from India as per “Communal Award” and build your own nation? Bigots like you would rather troll with strawman agruments than work to remove caste boundaries. I remember reading about a rather bizarre case a few years ago in which a a priest was murdered for having an affair with someone of a lower caste and was murdered by the said girl’s family! Although the murder was obviously tragic, the reversal of expected roles was interesting nonetheless. It seems that casteism is ingrained in our society no matter which caste one is from and that the only way to end it is the total annihilation of caste identity. Of course, I should probably note that the boy’s parents had issues with the marriage too. greta work you have did!! congrates.. but at same time could you help me also. because i too love a boy from scheduled caste but i belong to Backward cste so in my home they are not accepting. now i am working in a MNC company and he is working in a Small scale industry.. we want to marry with all of their permission . i try to convince my family but they are not. but in his home they are accepting. we need permission from both family. what should i do? pls help me!! What's Religion Doing in the 21st Century?